Mikami grew up in the Yamaguchi Prefecture of Honshū island. As a child, Mikami wanted to be a Formula One driver. He was also “obsessed” with the horror genre and films, such as The Texas Chain Saw Massacre and The Evil Dead. Studying karate and kendo as a teenager, he studied product and merchandise at university. Mikami graduated from Doshisha University, where he majored in the study of merchandise. Mikami attended a meet-and-greet for college graduates hosted by Capcom, and was interested in the presentation enough to apply. His application was initially rejected, then he was hired by Capcom a week later “out of the blue,” according to Mikami. He joined Capcom in 1990 as a junior game designer, and soon after created his first title there, a quiz game for the Game Boy titled Capcom Quiz: Hatena? no Daibōken. The game took over three months to develop. His following three games were all based on Disney-licensed properties: Who Framed Roger Rabbit for the Game Boy, and Aladdin and Goof Troop for the Super NES. Aladdin was his first hit, selling over 1.75 million units worldwide. Mikami also worked on Super Lap, an unreleased F1 racing game for the Game Boy that was scheduled to be released in 1992, but was canceled after eight months of development. After the release of Goof Troop, Mikami began development in 1993 of a horror-themed adventure game for the PlayStation set in a haunted mansion, called Resident Evil, originally conceived as a remake of Sweet Home (an earlier Famicom game by Capcom based on the Japanese horror film of the same name). 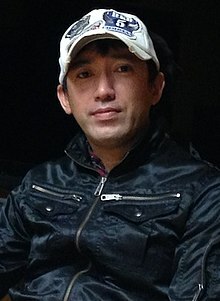 Resident Evil was initially conceived by Sweet Home director Tokuro Fujiwara; he entrusted Mikami, who was initially reluctant because he hated "being scared", with the project, because he "understood what's frightening." Mikami said that Resident Evil was a response to his disappointment with Zombie, a gory 1979 film by Italian director Lucio Fulci; Mikami was determined to make a game with none of the failings of the movie. The resulting game became Biohazard, an action-adventure game which combined 3D polygonal characters and objects with pre-rendered backgrounds and featured zombies (among other monsters) heavily influenced by George A. Romero's Dead films. The game was retitled Resident Evil during its English localization under Capcom USA's suggestion and was released in Japan and North America on March 22, 1996, and became one of the PlayStation's first successful titles. It was the first game to be dubbed a survival horror, a term Capcom coined to promote the game. It was later ported to the Sega Saturn. Resident Evil was considered the defining title for survival horror games and was responsible for popularizing the genre. Its control scheme becoming a staple of the genre, and future titles would imitate its challenge of rationing highly limited resources and items. The game's commercial success is credited with helping the PlayStation become the dominant game console, and also led to a series of Resident Evil films. Mikami had creative control over the screen play and script of the first movie being dubbed a creative consultant. They had Mikami in this position to make sure fans of the games would be happy. He then dropped out of the later movies because he believed that the movies were heading in the right direction. Many games have tried to replicate the successful formula seen in Resident Evil, and every subsequent survival horror game has arguably taken a stance in relation to it. After the success of Resident Evil, Mikami was promoted from planner to producer. As producer, he oversaw the development of Resident Evil's sequel, Resident Evil 2, which he intended to tap into the classic notion of horror as "the ordinary made strange," thus rather than setting the game in a creepy mansion no one would visit, he wanted to use familiar urban settings transformed by the chaos of a viral outbreak. The game sold over five million copies, proving the popularity of survival horror. Following its release in 1998, he oversaw the development of Resident Evil 3: Nemesis and also directed another survival horror title Dino Crisis, both of which released in 1999. Shortly after the release of Resident Evil 3 in Japan, Capcom Production Studio 4 was established in 1999. The studio's staff were mainly the key developers in the company's survival horror projects. Mikami was appointed as the general manager of the studio, and worked as executive producer for various games, including the original Devil May Cry (originally conceived as a Resident Evil game). In 2000, Mikami became involved as producer of a new Resident Evil game. Resident Evil - Code: Veronica. This game was designed from the ground up for the Dreamcast. Being a much more powerful console than the PlayStation, the Dreamcast allowed the team behind the game to add for the first time, 3D environments instead of the usual pre-rendered backgrounds. Resident Evil Code: Veronica was released in 2000 and went on to sell 1,140,000 units. That same year, Mikami's Dino Crisis 2 was released, selling 1,190,000 copies worldwide. In 2001, an expanded version of Code: Veronica was released for the Dreamcast exclusively in Japan, alongside a PlayStation 2 port that was released worldwide. This version of the game, titled Biohazard - Code: Veronica Complete Edition in Japan and Resident Evil - Code: Veronica X abroad, added ten minutes of new cutscenes not in the original release. The PS2 version, which initially came packaged with a trial version of Devil May Cry, went on to sell 1,400,000 units, according to Capcom's sales data for March 2006. In 2001, in what was to be one of his most controversial business decisions, Mikami formed an exclusivity agreement with Nintendo in which the main Resident Evil games would be sold only for the Nintendo GameCube. The GameCube would receive, in addition to ports of previous PlayStation and Dreamcast installments, three new numbered entries in the series: a remake of the original Resident Evil, Resident Evil Zero, and Resident Evil 4. Resident Evil and Resident Evil Zero were both released in 2002. The remake of Resident Evil was released in Japan on the sixth anniversary of the release of the original, on March 22, 2002. The remake was billed as the definitive version of the game, selling 490,000 copies in the US and 360,000 copies in Europe. In total, Resident Evil managed to sell 1,250,000 units during its first year of release. The remake's sales data was made public by Capcom during its Financial Review Report for 2002. On November 12, 2002, Resident Evil Zero was released. Gaming site gamefront.de reported that 138,855 copies of the game were sold on its first day of release. Capcom expected Resident Evil Zero to sell 1.42 million copies, but sold only 1.12 million. The fact that Resident Evil Zero did not match or surpass the remake's sales figures, spread fear among Capcom executives and share holders. They worried that Resident Evil 4 would not sell well enough on GameCube. In spite of Resident Evil Zero's underwhelming sales, Mikami remained confident in his support for Nintendo and announced four exclusive titles for the GameCube under development by Production Studio 4 in addition to Resident Evil 4; P.N.03, Viewtiful Joe, killer7 and Dead Phoenix. This lineup became known as the Capcom Five. The first of these games to be released was the Mikami-directed P.N. 03. The game was both a commercial and critical failure, receiving lukewarm reviews from the press and selling below expectations. As a result, Mikami stepped down as manager of Production Studio 4, while remaining as one of the head producers within the team. After his failure with P.N.03, Mikami decided to concentrate instead on the creative aspects of the Capcom 5. He eventually took over directorial duties for Resident Evil 4 from previous director, Hiroshi Shibata. Under his direction, Resident Evil 4 went through some substantial changes. Resident Evil 4 was released in 2005 and was one of the GameCube's top-selling titles, selling 1,250,000 units worldwide within a year. The game was critically praised, winning many game of the year awards. Resident Evil 4 is regarded as one of the most influential games of the 2000s decade, due to its influence in redefining at least two video game genres: the survival horror and the third-person shooter. Resident Evil 4 attempted to redefine the survival horror genre by emphasizing reflexes and precision aiming, thus broadening the gameplay of the series with elements from the wider action game genre. It helped redefine the third-person shooter genre by introducing a "reliance on offset camera angles that fail to obscure the action." The "over the shoulder" viewpoint introduced in Resident Evil 4 has now become standard in third-person shooters, including titles ranging from Gears of War to Batman: Arkham Asylum. It has also become a standard “precision aim” feature for action games in general, with examples ranging from Dead Space and Grand Theft Auto to the Ratchet & Clank Future series. Mikami touted the game as a GameCube exclusive. In an interview with a Japanese magazine, Mikami even said that he would "commit harakiri" if it came out on another platform. This was loosely translated as Mikami claiming to "cut [his own] head" and later parodied in God Hand, which featured a racing dog named "Mikami's Head". In a 2017 interview, he apologized for Resident Evil 4 going multiplatform. After the success of Resident Evil 4, Mikami left Studio 4 and was transferred over to and originally established Clover Studio in July 2004, which employed an all-star lineup of Capcom development talent, including Atsushi Inaba (producer of Steel Battalion and Viewtiful Joe), and Hideki Kamiya (Devil May Cry director). At Clover, Mikami directed God Hand, a beat 'em up comedy game that parodies American and Japanese pop culture. It was released in Japan on 14 September 2006, and on 10 October 2006 in North America. After Clover Studio was closed in 2007, Mikami joined Seeds Inc, now known as PlatinumGames, the newly formed successor of his former studio. PlatinumGames is composed of several of Mikami's former Capcom colleagues, including Hideki Kamiya, Atsushi Inaba, Yuta Kimura, Nao Ueda, Mari Shimazaki and Masami Ueda. Mikami recently revealed that he formed a private development studio called Straight Story in 2006. The name of the studio is taken from David Lynch's 1999 film. Their works are under the PlatinumGames branding and he is a contract employee ("external board member") of PlatinumGames. He also collaborated with Grasshopper Manufacture's Goichi Suda on Shadows of the Damned using the Unreal Engine 3 and published by EA. Mikami revealed that Straight Story will close once development of Vanquish is completed. Straight Story will be replaced with Mikami's new studio, Tango, which has already been established. Much like Resident Evil and Resident Evil 4 before it, the third-person shooter game Vanquish, released in 2010, has proven to be an influential title for action games. It significantly improved upon the cover system, where in contrast to previous cover-based shooters, the cover in Vanquish is easily destructible, with often a single shot from a robotic enemy being enough to blast away the wall the player was hiding behind. The game also penalizes the player's ranking for the number of times they have taken cover, though its most important innovation is the power-slide mechanic that allows the player to slide into and out of cover at high speeds, or in bullet time when the player's health is low. The game was given GameSpot's Best Original Game Mechanic award for its rocket-sliding game mechanic, which acts as both a defensive escape and an offensive setup, opening up new gameplay possibilities for shooter games and increasing the pace significantly. The game has set a new trend, with its influence seen in other first-person shooters that have incorporated similar sliding mechanics, including Bulletstorm, Crysis 2, and Killzone 3. Vanquish was itself inspired by Tatsunoko's 1970s anime series, Casshern. A teaser website opened on March 18, 2010, titled "Mikami Project" with a countdown attached. The website changed into a job employment page, for Mikami's new studio, "Tango". On October 28, 2010 ZeniMax Media, parent company of noted game publisher Bethesda Softworks, announced Shinji Mikami joined ZeniMax after it acquired Tango Gameworks. Tango Gameworks currently has 65 staff but soon will have 100. An April 2012 Famitsu interview with Mikami revealed the codename title of Zwei for the company's survival horror game The Evil Within, with Mikami directing. The game was released October 2014. It uses a heavily modified external engine although the director wouldn't reveal which one. The game is published by Bethesda on Xbox 360, PS3, PC, PS4 and Xbox One. Mikami stated that this will be the last game he directs. He stated that it will be a "true" survival horror game, "one in which the player confronts and overcomes fear." because he was disappointed by recent survival horror games becoming action horror games. ^ a b c d e f Parkin, Simon (2014-10-19). "Meeting Mikami". Eurogamer. Gamer Network. Retrieved 2016-01-17. ^ "An Interview With Shinji Mikami". Resident Evil: The Official Comic Book Magazine #3. Image Comics, Inc. September 1998. ^ "Company Profile" (PDF). Capcom. May 2002. Retrieved 2011-02-15. ^ a b Schilling, Chris (2014-10-01). "The Career of Shinji Mikami in 7 Games". IGN. Retrieved 2018-03-19. ^ Jim Sterling (2008-06-09). "Fear 101: A Beginner's Guide to Survival Horror". IGN. Retrieved 2009-04-17. ^ Brett Todd. "A Modern History of Horror Games". GameSpot. Archived from the original on 2007-05-18. Retrieved 2007-03-18. ^ Richard J. Hand (2004). "Proliferating Horrors: Survival Horror and the Resident Evil Franchise". In Steffen Hantke (ed.). Horror Film. Univ. Press of Mississippi. pp. 117–134. ^ Travis Fahs. "IGN Presents the History of Survival Horror (Page 5)". IGN. Retrieved 2011-01-26. ^ a b Daniel Kaszor (December 30, 2009). "Decade in Review: The most influential video games since Y2K". The National Post. Archived from the original on June 9, 2010. Retrieved 2010-01-24. ^ James Brightman. "Capcom's RE4 Reinvigorates the Franchise". GameDaily. Archived from the original on February 14, 2008. Retrieved 2008-02-14. ^ "Gateway to Horror". UGO Networks. 2008-10-17. Archived from the original on 2012-06-05. Retrieved 2009-04-16. ^ "Shinji Mikami (Person) - Giant Bomb". Giant Bomb. Retrieved 2018-03-19. ^ "Grasshopper Manufacture Licenses Unreal Engine 3" (Press release). Epic Games. 2008-10-07. Retrieved 2009-04-02. ^ David Hinkle. "Shinji Mikami opening new Tokyo-based studio, Tango". Joystiq. ^ "Killzone 3 Review". Computer and Video Games. Archived from the original on 2011-02-05. ^ Spencer (2010-07-03). "Vanquish Visuals Inspired By Casshern". Siliconera. Retrieved 2010-07-05. ^ "Mikami Project" (Press release). 2010-03-18. Retrieved 2010-03-18. ^ a b Purchese, Robert (March 13, 2012). "Resi creator Shinji Mikami sheds light on Bethesda/ZeniMax game". Eurogamer. Retrieved May 16, 2012. ^ Drake, Audrey (April 26, 2012). "Resident Evil Creator Returns to Survival Horror". IGN. Retrieved May 16, 2012. ^ "Bethesda.net". bethsoft.com. Retrieved 2018-03-19. ^ Brown, Nathan (April 26, 2012). "Mikami: Zwei is "pure survival horror"". Edge. Retrieved 8 August 2012. ^ "Who Framed Roger Rabbit (1991) Game Boy credits". MobyGames. Retrieved 2018-07-06. ^ "Goof Troop (1993) SNES credits". MobyGames. Retrieved 2014-11-16. ^ "Steel Battalion (2002) Xbox credits". MobyGames. Retrieved 2018-03-19. ^ "Steel Battalion: Line of Contact (2004) Xbox credits". MobyGames. Retrieved 2018-07-06. This page is based on the Wikipedia article Shinji Mikami; it is used under the Creative Commons Attribution-ShareAlike 3.0 Unported License (CC-BY-SA). You may redistribute it, verbatim or modified, providing that you comply with the terms of the CC-BY-SA.